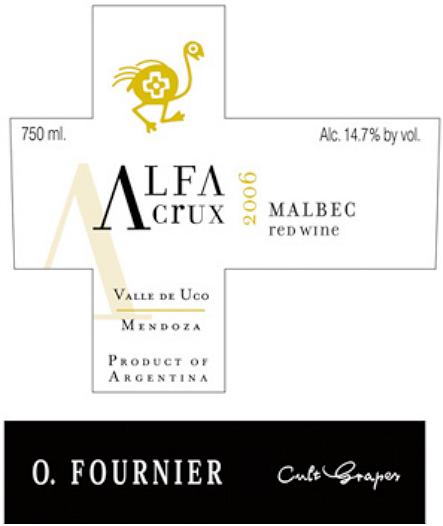 Produktinformationen "O. Fournier Alfa Crux 2011, 100% Malbec"
Rotwein O. Fournier Alfa Crux 2011 aus Rebsorte 100% Malbec. Ausbau: 20 Monate in neuen Barriques (80% französisch und 20% amerikanisch). Verkostungsnotizen: Kirschenduft in der Nase, Trüffel, dunkle Schokolade. Mokka, am Gaumen komplex und fleischig. Elegant und lang. The year 2011 was presented with a relatively short winter with temperatures a few degrees above average. There was no Zonda wind and late frosts during flowering, this led to a good maturation. The average rainfall was above average but this presented no problems with the health of the grapes. It was a year with great temperature, which enabled musts have excellent acidity. It was a great year for fresh wines with great aptitude for aging. Vineyards Description: Vineyard age between 10 and 20 years, stony soils, permeable and poor in organic matter. Conduction system, pergola and vsp, the vineyard has no anti hail net and the yield per hectare was 40-60 quintals. Winemaking characteristics: Hand-picked in boxes of 18 Kg Double selection of grapes and berries in the winery. Cold maceration for 5 days at 8°C, selected yeast F-15 and F-10. Alcoholic fermentation in French oak vats. Skin contact, 28 days. Malolactic fermentation in oak barrels. Ageing: 20 months in new oak barrels. Weiterführende Links zu "O. Fournier Alfa Crux 2011, 100% Malbec"